Natasha Perova’s trailblazing series has translated 170 authors since 1991, opening up post-Soviet literature for the wider world. The pioneering publisher talks to RBTH about the history of Glas and the current attitude to publishers of Russian literature. “Initially I wanted to embrace the entire literary scene and published only anthologies,” she says. “There was too much good material: new works, formerly banned books, and rediscovered classics from the 1920s and 30s.” Glas has published 75 titles over 24 years, but, since half of them are anthologies, these volumes contain 170 different authors “representing various trends and types” of Russian literature. Translator Arch Tait, who helped edit Glas in the 1990s, praised Perova’s altruistic dedication, her keen eye for literary talent, and tireless “filtering” of thousands of manuscripts. “Natasha has published hundreds of people for the first time in English,” he told RBTH. There were difficult days ahead. “I thought the world would gasp with admiration,” says Perova, but “both publishers and the public were slow to appreciate contemporary Russian literature.” The first print run of 125,000 was scaled down dramatically, but there was always an appreciative audience. Perova says that the “invariably supportive and complimentary” readers' letters were what kept her going in the tough early days. Perova also sees a clear connection between the declining market and geopolitics. 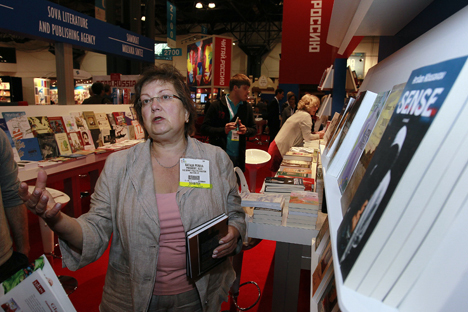 “Our American distributors told me this summer that due to the worsening attitude towards Russia they can no longer sell our books successfully,” she says. However, the distributor in the UK, where sales are also down, will continue selling back titles as long as they have them.